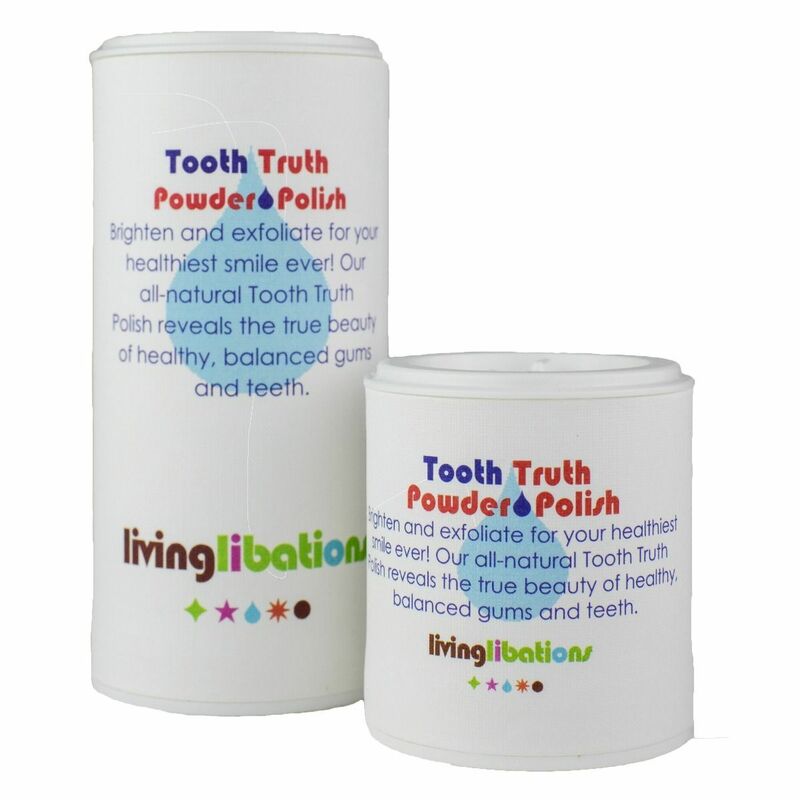 Anoint the landscape of Living Libations Tooth Truth Powder Polish contains an all-natural exfoliating elixir of nature’s purest, most gentle-yet-powerful cleaning and whitening ingredients. Far from a mere cosmetic care, the ingredients contained in our Tooth Truth Polish do much more than make your smile look good. Packed with endless alkalinity, this polish speaks truth to power to plaque and the bacteria that cause oral odor. Tooth Truth Tooth Powder Polish will let your teeth gleam as your smile. Place a pinch on a dry toothbrush along with a tiny drop of Neem Enamelizer. You can also add a drop of Yogi Tooth Serum or Healthy Gum Drops for an extra burst of fresh, plant power. For an even more invigorating impact, use Tooth Truth Powder with a dry round-head electrical toothbrush. Safe to use every day. Sea Salt (Sodium chloride) – Purified sea salt is rich in trace minerals. Sea salt is historically known to soothe gums and alkalinize saliva for a happy oral environment. Baking Soda (Sodium Bicarbonate) – Teeth thrive when they are bathed in a sea of sweet saliva, and baking soda buffers and neutralizes food acids. In addition to being an effective cleaning polish, baking soda is gentle. It has significantly lower abrasiveness than the cleaning agents of chalk and silica that are used in commercial toothpastes, and the baking soda’s natural alkalinity neutralizes bacterial acidity. Magnesium Bicarbonate – This naturally occurring compound has been historically used to prevent deposits on the teeth. It is also said to help eliminate plaque while brushing, and it whitens the teeth. Arrowroot (Maranta arundinacea) – Arrowroot is traditionally used to alkalinize saliva as a natural tooth polish. MSM (Methylsulfonylmethane) – MSM is a biologically-active organic compound that is a source of sulfur. This naturally occurring sulfur is found in nature and all living organisms. It is a critical nutrient for the human body. And, a silica pack to prevent moisture.